The Nokia Pulse Beta app for private check-ins and push communication has been already ported to the Windows Phone Marketplace, and is hiding there in the shadows. In beta form, of course. The app allows for a new take on mutually keeping track with friends and family after a registration with Nokia Services. It supports push notifications, and also has a Web interface so you can keep an eye what's going on with your circle while working on the desktop. Nokia Pulse is location aware, and allows you to follow what's interesting around you, who else is nearby and communicate with preset groups in your friends or family circle. When you land at the airport, for instance, instead of calling/texting people to pick you up, you can shout out "Landed!" via Nokia Pulse, and the app will send it along with your location to the recipients. They, respectively, can send you "on may way" message, which will have their whereabouts in traffic attached. Alternatively, the app lists activities or places around you while you wait somewhere with relevant info, so you can share them and comment or arrange meet-ups there, sort of a more private version of Facebook or Twitter updates. 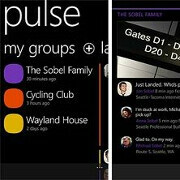 The promo video below shows some of the Nokia Pulse Beta's features. Nokia is back on track..lucky for ms..
its about time way to go nokia!!!!!!! Now all they need to do is market it big time to the masses. . .